Everybody knows that plants are alive. To know that they have consciousness is another thing entirely. Even after becoming aware that there is consciousness in all things, including plants, I still just assumed that plants were distant, detached, and didn’t really care about people, if they even noticed us at all. Nothing could be further from the truth. Wild oats feel very good to be around. I don’t know that they care one way or the other about people, but they just have a very positive-feeling energy. What is called Mountain Laurel in Texas (which is a different plant from the Mountain Laurel in NC!) really likes people, and really appreciates it when you stop to smell its flowers. I have found that some plants are so used to being ignored by humans that they are surprised and sometimes a little frightened when someone pays attention to them. One spring when I was walking at my favorite preserve in Texas, I noticed a young mesquite tree with a lot of new foliage. Now, the typical mind-set about mesquites is that they’re not worth much, mostly because they don’t make any shade to speak of, and people tend to ignore them. The leaves in general are small and just not attractive at all, but this new foliage was such a vivid green that I had to stop and touch it, and as I did I talked to the tree. I found that it was very surprised that I was talking to it, and a little nervous. I sensed that it had thought for its whole life that it was invisible, only to suddenly find out that it could be seen! What a shock that would be! Other spiny plants are just very matter-of-fact, with no malice but also no pity: “If you touch me, you get hurt. That’s just the way it is.” Shrug. Poison ivy seems to be variable: In Texas, I found it to be very timid, and somewhat hurt by the way people feel about it! “I’m just trying to survive!” In North Carolina, on the other hand, the poison ivy on our land seems to be somewhat obnoxious. So I’m not sure I really have a handle on poison ivy just yet. Our first spring in NC, Jill and I lived in a house that was literally surrounded by all kinds of flowers, and visiting with them was a lot of fun. 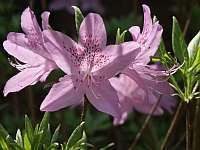 There were two azalea bushes, pink and white, and they both just loved all the attention when they were in full bloom! In contrast, there was another shrub that was covered in the most beautiful yellow flowers. I stopped to talk to it while I was admiring it, and its response was something like, “Yes, well, that’s very nice, but I’m really very busy.” (In other words, “I don’t have time for you, leave me alone!”) What was interesting about that was that I actually had a sense of “busy-ness” around that shrub; it was like it was surrounded by invisible bees, all buzzing hurriedly around. It reminded me of descriptions I’ve read of nature spirits humming around plants, performing their care-taking tasks. There was another very small plant that was growing way back in the brush, and I noticed it only because of its bright red flowers. I crawled in to get a closer look, and told it how beautiful its flowers were. Its response was along the lines of, “Yes, aren’t they!” Not one shred of modesty there! And one other flower that I particularly liked was a very tiny purple thing, only about one-eighth inch across, that grew very close to the ground. I had to get down on my hands and knees to get a good look at it, and when I did, it seemed to kind of recoil in fear! Of course, I think I might feel the same way if a giant bent down to peer at me with a 20-foot eyeball! When you find out that plant communication is a two-way street, it’s fascinating and a lot of fun. But it also can make it more difficult when you find that a particular plant or plants just don’t fit into your life anymore. You suddenly find that it’s not as easy to pass plants on to someone else, or (yikes!) toss them on the compost heap! Jill and I had to find new homes for many plants when we moved from Texas to NC. We had had some of them for decades and the truth is that some of them experienced a lot of anxiety when they were carried off to live at our friend’s house. The way we handled it was to talk to them, tell them what was happening, and ask the universe to help them with their move. It also helped a lot that they all went to the same new home. When you’re going to have to kill a plant, that’s handled differently. You talk to the plant, tell it what’s going to happen and when, and tell it that it needs to find another home before “the day.” The plant’s spirit will leave the physical plant and go to live somewhere else. At our new home in NC, we found poor shrubs that were planted in a location that was really bad for them; they were stunted and full of fungus. To make matters worse, they were prickly and inhospitable, and we didn’t want them anyway, so we decided to cut them down. When we went to tell these shrubs that we were going to cut them down, we had planned to do the cutting a couple days after telling them. (Everybody likes a little notice before something drastic happens!) But these plants were in such bad shape, they didn’t even care; they seemed to be saying, “Do it now.” So we did. Communicating with plants is one of the most remarkable things I’ve ever experienced, possibly even more remarkable than communicating with animals. (Possibly because it’s harder to imagine plants having personalities and emotions!) And it drives home the fact that we’re just a part of a giant web of life, where everything that exists has consciousness.